Attaching the 48px icons  , I had shown Kal on #evince. He mentioned few problems on the evince side and was not sure if the annotations would work , do let me know if it works and I can get the rest of the icons done too. Also , attaching the 24px versions of a couple of icons  ,of the idea I had. Want me to run reg testing with your changes? Or not still? hmm, I'll review it, I hadn't noticed it. Yes, it's because of bug #25441, not sure how to fix it, though. > Want me to run reg testing with your changes? Or not still? 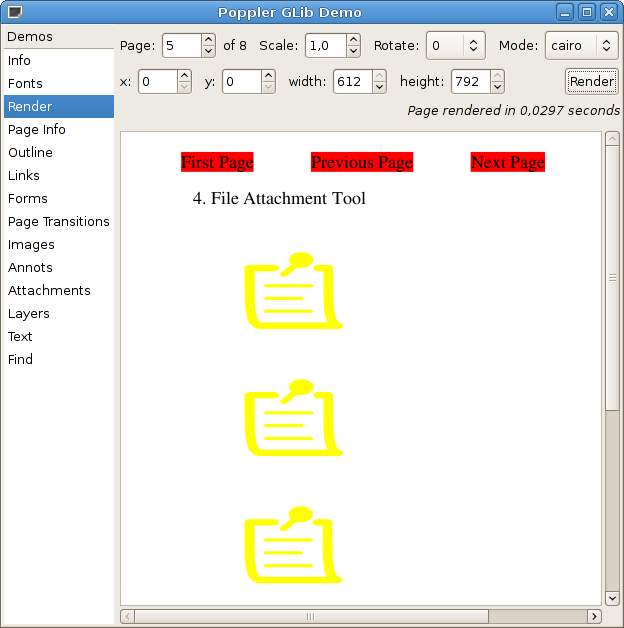 Not yet, I'm going to add more icons for Text annots and probably for file attachment annots too. The important thing here is not the icon itself, but how we apply the annot color (yellow in this case). 1) and 5) are indeed the same approach but with different icons. Ulisse and myself have completed the set of icons as requested by Kal. > which one do you prefer? 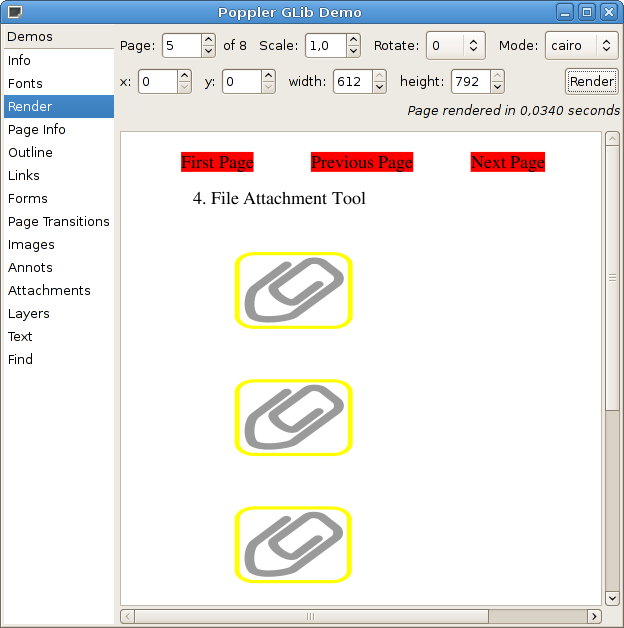 2.- http://people.freedesktop.org/~carlosgc/poppler-paperclip-note2.png looks good to me. Ulisse and myself really dont like option 2,  for 2 reasons. 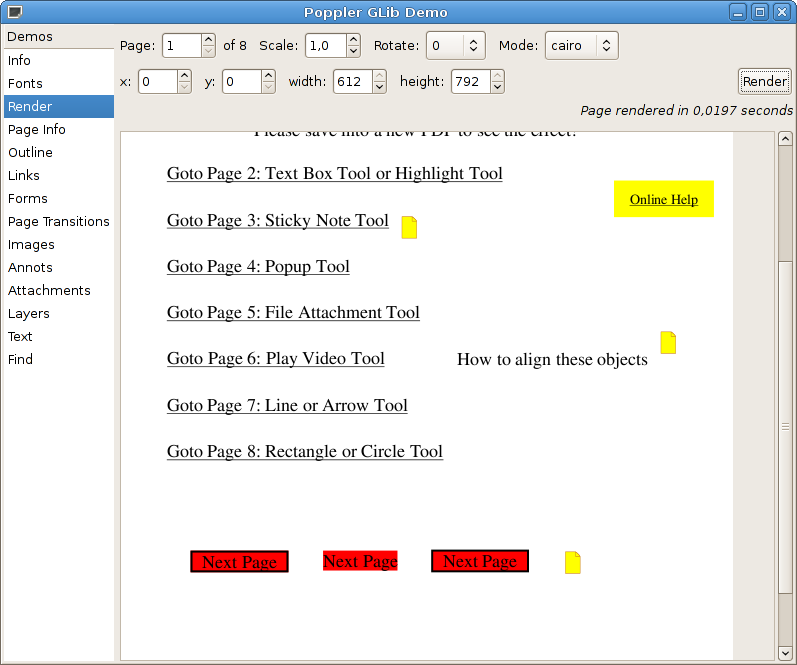 - It uses too much color and distracts the user from the real content of the page. - If we are to use option 2 , then all the annotation icons wouldnt look consistent. If the icons are to be done as in option 2  , we'd end up with the same loud colored icons of acroread , which are very distracting from the page contents. > > good to me. > Ulisse and myself really dont like option 2,  for 2 reasons. > colored icons of acroread , which are very distracting from the page contents. yes,i hguess you are right. You may or may not like how Adobe Reader draws the icons but the specification says how they should be drawn and not doing it the way the specification says because you think it looks ugly is not an option, sorry. > because you think it looks ugly is not an option, sorry. Are you sure that the icons are specified to be done the exact same way? "C  - array -  The background of the annotation’s icon when closed"
But , strictly speaking the acroread icon's background isnt really colored. Rather the color is applied within the icon. While the background is transparent. It seems that the acroread icons were designed to only allow the use of color rather than sticking to the exact specs. IMO , we can take the same liberties too. To me the specs are a little fuzzy , and too huge. I might have missed the part where the icon design was specified. Well, I also prefer option two, but the spec doesn't say proposed icons are wrong. Attaching the latest set of icons. Here is the updated set of patches for current master using the new icons. I just filed a bug in Okular related to this. This was 9 years ago but the ticket is still open and the patches still exist. > Was this ever merged? Do you know how to read? comment #21 is *VERY* clear, isn't it? Let's try to keep the comments constructive and technical so we can avoid arguments that will distract us from the common goal that we all share of improving annotations. 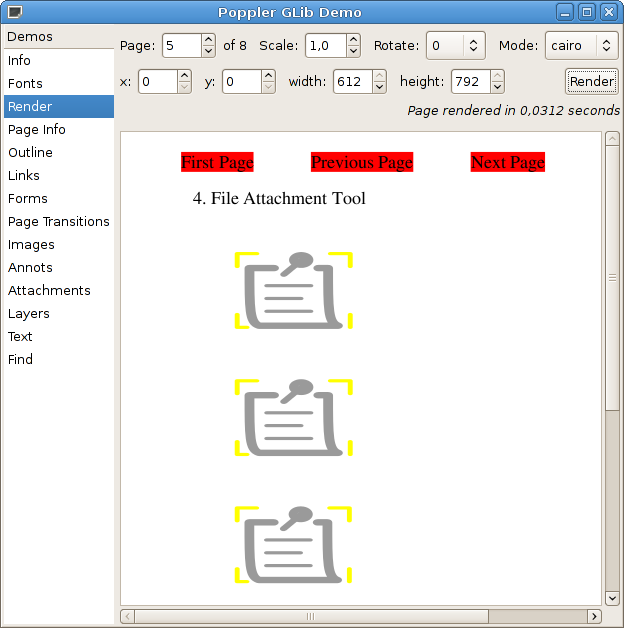 You can subscribe and participate further through the new bug through this link to our GitLab instance: https://gitlab.freedesktop.org/poppler/poppler/issues/522.